Cooking for a crowd does not have to be difficult. If you cook basic yet tasty food that everyone will enjoy, you will save yourself from making lots of fiddling things and trying to please everyone. It is a good idea to find out about the details of the guests so you can plan accordingly. You will need to know numbers, any allergies, religious restrictions and ages. There is no point serving up a big bowl of hot chilli if all your guests are vegetarians who like bland food! It is often unnecessary to make lots of different dishes. ‘Pot Luck’ suppers, where everyone brings a dish, are a great way to keep costs down and not have too much work for one person. You could also try one of the following recipes – they’re all great ideas for cooking for a crowd, without it looking too cheap or simple. The trick is to make something simple look like you’ve gone out of your way! Good ways to do this is to decorate your table nicely, have plenty of napkins, play some great music (bossanova is great for creating an atmosphere) and give everyone a welcome drink as they arrive. 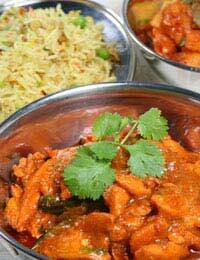 A good chicken curry is a real crowd pleaser. It is an inexpensive way to feed lots of people and you won’t need to tend to it all night. It is best not to serve it with rice as this is not great for keeping warm – better to serve it with lots of chapattis, dishes of raita and plenty of pickles. Start by frying together a teaspoon of garam masala and cumin seeds in plenty of oil. After a minute or so, add in four chopped onions and let it cook until they’re brown. Next, add four chopped garlic cloves, a thumb sized piece of ginger and three chopped chillies (leave the seeds in if you like it hot, take them out for a milder curry). Then add in your chicken – either four chicken breasts or a mix of thigh, breast and leg meat. Take the skin off for a healthier curry, or fry the meat with the skin on separately before adding it. Once it’s browned, add a teaspoon of ground coriander, a teaspoon of turmeric and the same of ground cumin. Fry that for about thirty seconds and then add a tin of chopped tomatoes or a carton of passata. Add enough water to cover, bring to the boil and then leave to simmer for as long as you’ve got – at least 40 minutes. Serve with plenty of chopped fresh coriander. A mixed bean chilli is a great way to cook for a crowd that has some vegetarians. A tasty bean chilli appeals to meat eaters too as it’s full of flavour – you really don’t miss the meat. This also makes it an inexpensive way to cook for a crowd. Serve your bean chilli with bowls of soured cream (thick set Greek yoghurt with a little lemon juice stirred in if you can’t find soured cream), grated cheese and shredded lettuce. You can have a basket with slices of baguette, lots of roasted new potatoes, jacket potatoes, wraps or tortilla chips. Start by frying together at least three large sliced onions in plenty of olive oil. Add in four cloves of chopped garlic and three red chillies. Once they’re browned, add in at least three tins of drained beans – try one of kidney beans, one of chick peas and one of cannelli beans. Add a tin of chopped tomatoes, a pinch of sugar and a tin of baked beans (it’s the secret to a good chilli!). Then test the seasoning and let it simmer, adding in some water if it looks too dry. Delicious!